April was another interesting month to participate in the Virtual Paintout. Bill Guffey hosts and chooses a location that Google Street View vehicles have covered. Bill posts the artists' submissions on his blog and on Facebook. Artists virtually "walk" around and choose a view to draw or paint. 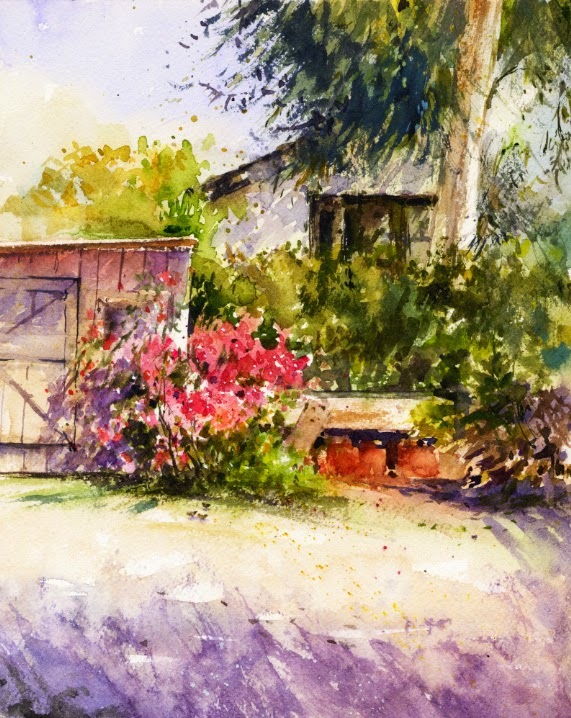 It's always exciting to see what other painters found for their views. 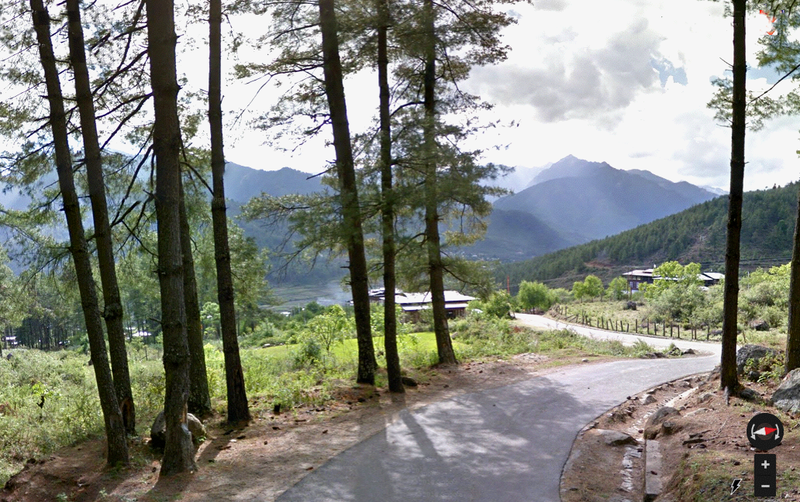 As always I wished for more time to browse around the Kingdom of Bhutan. The internet says it is most famous for its ranking as the happiest country in Asia. 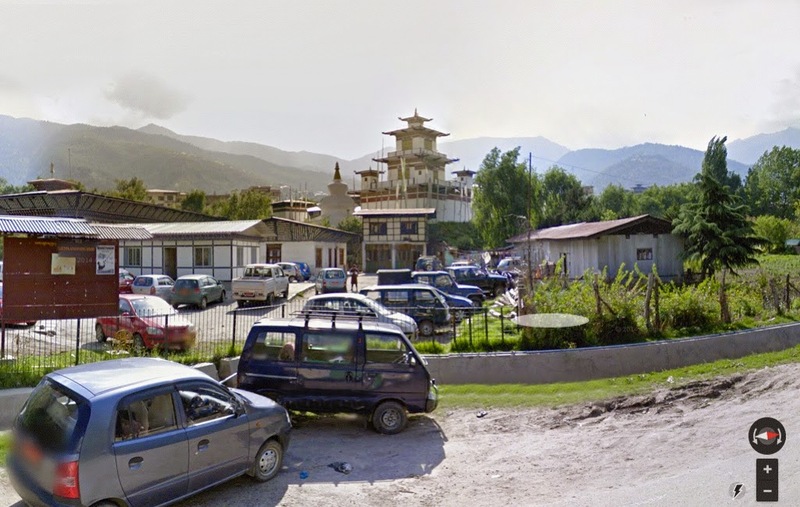 It's located at the eastern end of the Himalayas, very mountainous. 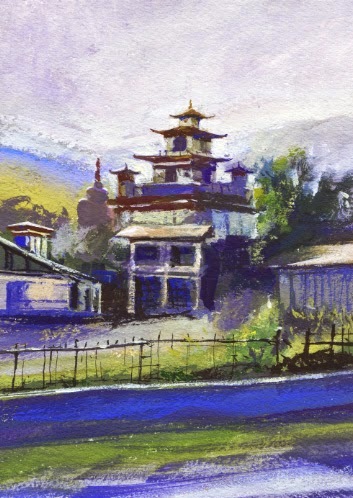 To me there seemed to be a peaceful look to the characteristic "castle fortress" architecture style, like the Buddhist monasteries built on cliffs in the clouds. Unfortunately no Google Street View there! We were at the Arboretum recently for our plein air location planning session. This always takes awhile which leaves only an hour or so for painting. The last time I painted there, I did a watercolor, Peacock Cafe. We all headed for an area to hopefully see some bright orange California poppies blooming. The poppies turned out to be a little past their prime. But, there was some shade and a view of part of the lake. The west end of Baldwin Lake was very brown and muddy looking with some interesting reflections. I loved the palm trees and tried a gouache piece in our short amount of time. A friendly mallard duck came by to check us out and I thought of adding him to my piece. Maybe! 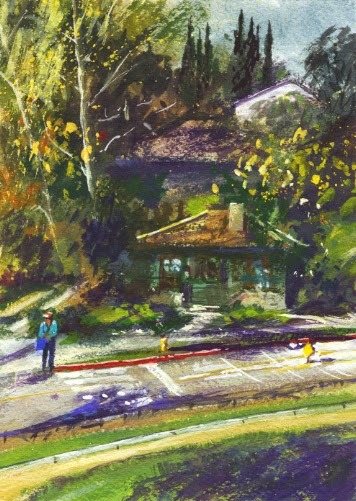 Last week one of the plein air groups met at Monrovia Library Park. It's been over two years since I painted there. I posted that watercolor in Library Park. I would have painted that piece differently now. Progress I guess! At the recent paint-out, our drought here in California was on my mind. We've had four years of below average rainfall and we'll have to cut way back on water use. As I was looking around the park, the spectacular turquoise, scalloped fountain caught my eye. It was turned off and I thought of the drought. A few minutes later it came on! I had to give it a try while it's looking impressive. 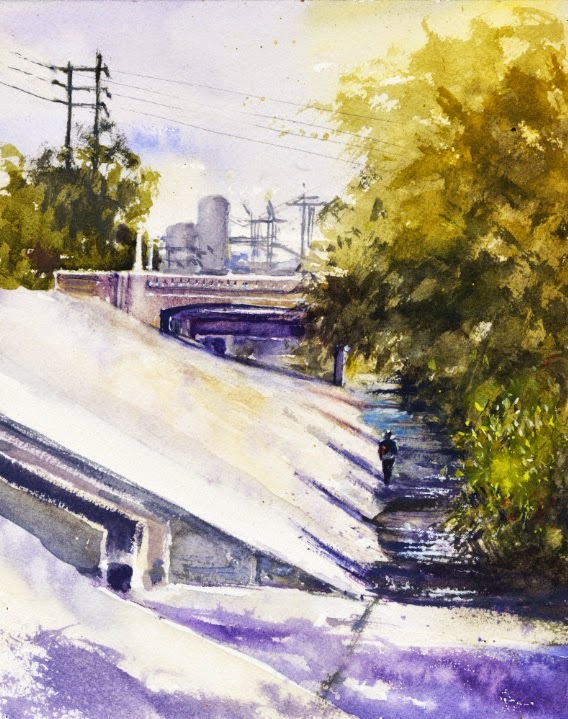 The new L.A. River paint-out group had Bette Davis Park on the schedule for last Tuesday. I've been by the park many times but never saw the river from there. After phoning our organizer to find the group, it turned out to be a nice area for painting...just up an embankment and there was the river. We had a small group of painters which is always nice. There were some busy plovers wading in the sandy parts of the river but I couldn't get a good photo. This was the second time I've painted with the group. Rattlesnake Park was my first experience and I posted that gouache piece in Rattlesnake Park. It's an exciting environment, combining nature with urban, and I'm looking forward to the next outing! Yes, there is a Dutch style windmill in Arcadia, California. The building was a Van de Kamp's "Holland Dutch Bakery" restaurant completed in 1967. 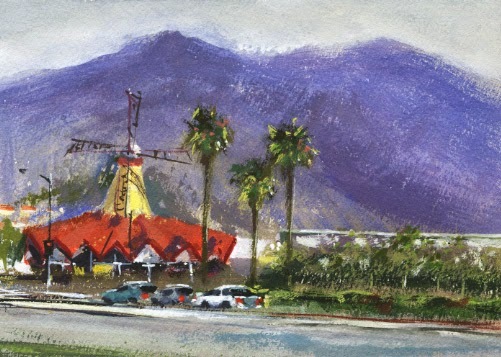 It's now a Denny's and the last surviving windmill-topped restaurant in Southern California. Denny's wanted to demolish the windmill in 1999 but loud protests from residents changed their mind. So this example of Googie architecture is still there. 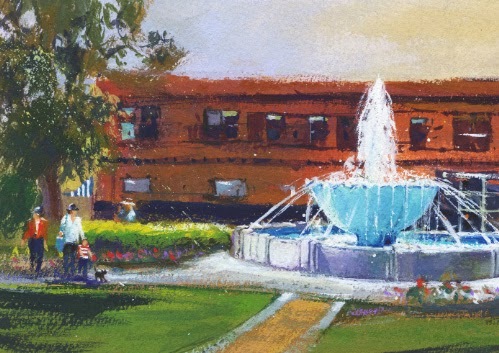 It's across the street from a scheduled plein air painting location at Arcadia Park. 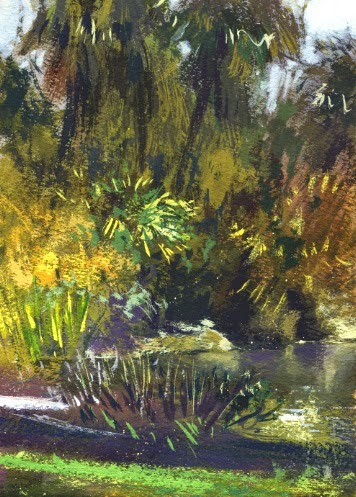 We were there a couple weeks ago and nothing caught my eye to paint at the park. I had to try my first windmill with the bluish morning mountains behind. On April 4th we were painting at Arlington Garden. I expected to see the field of red poppies as we saw last year but there were just a few as compared to April '14. I painted two pieces of the poppies at one paint-out last year and posted those pieces in The Red Poppies!. Not so many poppies, that's OK since Arlington Garden has many wonderful views to paint. There's a shed on the north side and a work/potting area. I tried a watercolor of it on my first paint-out there three years ago, Saturday Paint-Out. Time to try it again since I thought it looked very colorful with the bougainvillea and I liked the light on the tree in the background. A nice spring day for painting. Our Friday paint-out group was back in Highland Park recently. It's a neighborhood of Los Angeles and our official location was the 1889 Church of the Angels. I painted there a year or so ago with another group and posted that gouache piece in Two Gouaches. The church is on Avenue 64 which is hilly and has an attractive hillside of trees and interesting homes. I decided to paint the street scene again instead of the church. I'm sure I need more practice with difficult buildings. Maybe next time! In February the Saturday paint-out group returned to Vista Hermosa Park near downtown. It was my third time painting there. On our first visit the weather was threatening and the distant Los Angeles skyline had lovely, soft, cloudy edges. 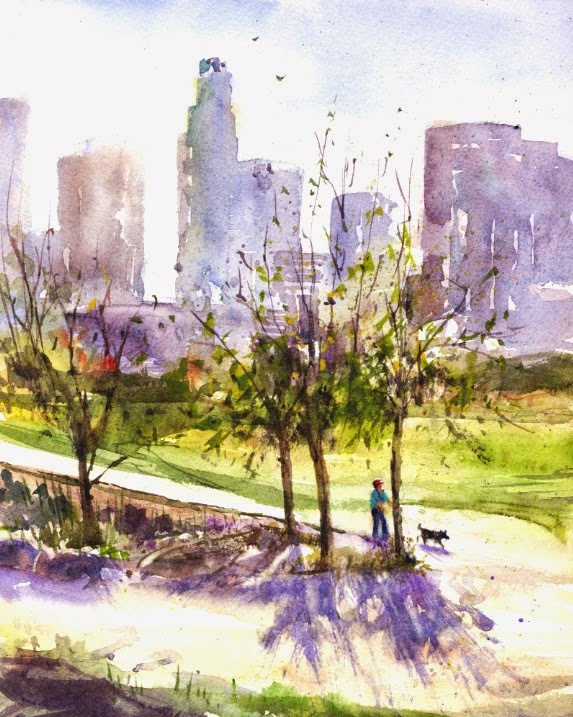 I posted that watercolor in Vista Hermosa Park, which was also my first try at a cityscape. Our next visit was about a year later on a bright sunny day. I tried a warmer toned watercolor, Downtown Views! Of course Vista Hermosa means Beautiful View in Spanish and the hilly park offers magnificent views of the city. 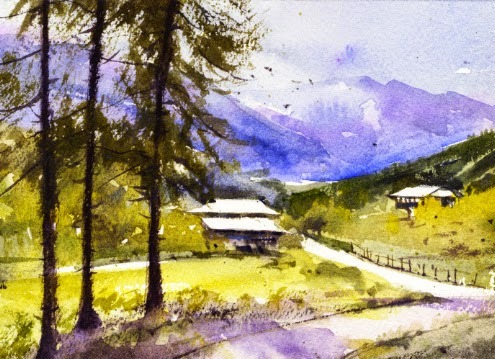 This park is always an exciting place to visit since the views are so wonderful, as well as challenging to paint.